like they all did, and, like many, had the super powers as well. He had the secret identity as a wealthy wastrel, like Firebrand, The Whip and, of course, Batman. He even, like The Flame, Amazing-Man and a lot of others, had Tibet. Only thing is, he didn't start out in comic books — that's just where he experienced his full flowering as a character. The Green Lama was one of a minority of superheroes, including The Shadow and Doc Savage, who made their debuts in pulp magazines. His first appearance was in the April, 1940 issue of Double Detective, where, in a novel-length story written by editor Kendell Foster Crossen (under the pseudonym "Richard Foster"), he underwent the usual origin story, then got down to the serious business of foiling a criminal mastermind bent on taking over the world. While in college, millionaire Jethro Dumont became interested in Eastern religion, and took off for Tibet to learn more. Ten years later, he'd learned as much about it as most westerners ever do, and had even become a priest. He'd gained vast powers in the process, the most frequently seen of which was the ability to fly (but he could also do other odd things, such as generate electricity from his body). At that point, he returned to America with his manservant Tsarong, took up residence on New York's Park Avenue, and decided the best use of his abilities lay in fighting evil. He was often heard to say "Om Mani Padme Hum", which, when uttered slowly and repetitively by your typical Buddhist, is an aid to meditation, helping him achieve a level of peace and serenity. In Jethro's case, however, it was used in connection with superheroics, as a magic word to unleash his powers — kind of like "Shazam" or "3X2(9YZ)4A", only not as catchy. The Green Lama appeared in about half a year's worth of monthly pulp adventures, then went a year of bimonthly ones. A final issue staggered out a year and a half after the last regular one, for a total of 14 novels, ending early in 1943. But by then, his comic book career was well established. He was licensed for that medium by Prize Publications (later responsible for Young Romance and Fighting American), which launched him in its eponymously-titled Prize Comics #7 (December, 1940). 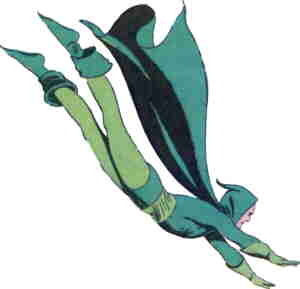 In Prize Comics, Crossen (who was also responsible for Atoman) continued to write the Lama's scripts, while the art was provided by Emanuel "Mac" Raboy, whose graceful figures and fine linework helped make the character a classic. Raboy became better known later, for setting the visual tone of Captain Marvel Jr. Still later, he became better known yet when he went to work for King Features Syndicate, taking over the art on Flash Gordon. Raboy modeled his costume after a Tibetan monk's get-up, only green, but it quickly developed along normal superhero lines, getting skin-tight while still retaining elements of what it started out to be. But Raboy did only the first three Prize Comics episodes. In that title, the Lama was generally drawn by lesser talents, the most notable of which was Jack Binder (Daredevil, Mary Marvel). The Green Lama continued in Prize Comics for almost three years, during which time he participated in a large crossover — in #24 (October, 1942) he, The Black Owl, Dr. Frost (no relation), The General & the Corporal, and other Prize Comics characters teamed up to fight Frankenstein. But as of #35 (October, 1943), just seven months after his final pulp magazine, he was replaced by a pair of home-grown superheroes, The Flying Fist & Bingo. A little over a year later, The Green Lama was picked up by Spark Publications, a very minor outfit whose other characters include Golden Lad and Lieutenant Hercules. Spark started him out in his own title, with a cover date of December, 1944. Again Crossen wrote the scripts, and again, Raboy was the artist. This time, Raboy stuck with the character through most of his brief run. After the 8th issue (March, 1946) the character went into limbo again. This time, he stayed there for three years, emerging on radio on June 5, 1949. His voice was done by Paul Frees, who made a career of cartoon voices. His work ranged from Disney's Ludwig von Drake to Hanna-Barbera's Squiddly Diddly, but he's probably most famous for Jay Ward's Boris Badenov. The show lasted only a couple of months, ending August 20 of the same year. That was the end of The Green Lama, as far as new material goes. In 1964, comics entrepreneur Israel Waldman, reprinter of Doll Man, Yankee Girl, The Blue Beetle and other characters he didn't own, ran a Green Lama story in Daring Adventures #17. During the early 21st century, High Adventure magazine reprinted several of his pulp magazine adventures, as well as characters from the other hero pulps. To a comic book aficionado, however, The Green Lama will always be Mac Raboy's lithe figure gliding gracefully through the air, dressed in a streamlined version of a Tibetan monk's outfit. Text ©2006-10 Donald D. Markstein. Art © Frank A. Munsey Co.